Accurate estimations of animal populations are necessary for management, conservation, and policy decisions. However, methods for surveying animal communities disproportionately represent specific groups or guilds. We present a modelling framework that both compares and integrates field-collected dung, visual, and camera trap data to more robustly estimate animal populations in data-scarce environments. Knowledge of gut passage time is essential for understanding vertebrate-mediated ecological processes like seed dispersal. We apply and compare three novel methods -- modified seeds, colored plastic pellets, and Thermocron temperature logging iButtons -- to estimate the gut passage time in wild forest elephants for the first time. Highly-variable, synchronous seed production in forests provides a pulsed resource that both supports and destabilizes food webs. We provide a model that combines knowledge of consumer life histories with the emergent space-time covariance structure of fruit and seed production to assess the ability of habitats to provide for important consumer groups. Low intensity logging has been proposed as a sustainable solution for timber harvesting in the tropics, but long-term alterations in seed dispersal may have big effects on community composition and ecosystem function. Large herbivores like forest elephants might be the only thing keeping Afrotropical forests from turning into the Neotropics, and they're headed for extinction. We've long suspected that later-born infants fare better than first-born siblings, but 34 years of macaque survival data suggests otherwise. 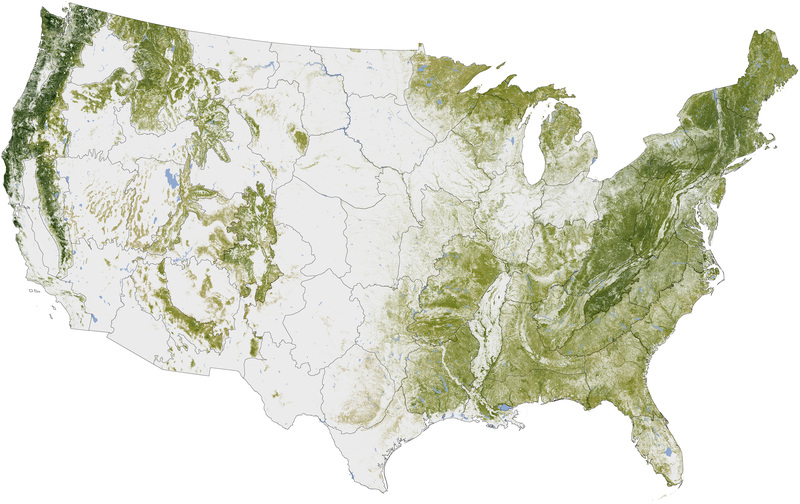 How Much Carbon Will America's Future Forests Hold? Warm, dry conditions are causing established forests to move away from historical ranges and into formerly inhospitable terrain. What will that mean for America's carbon sequestering future? See for yourself with an interactive map. © Chase Nuñez . All rights reserved.